Traditional techniques, hand made production. Starting from making models and moulds, through the casting of each piece by hand in plaster moulds, firing and delicate hand painting before glazing – everything is hand made, as it was centuries ago when these processes ere developed. That is why each product is unique. Individual brush strokes show the artistry of the painters. The ceramic workshop in Nakomiady was established at the beginning of the 18th century to supply the manor. In the beginning, it focused on brick production. Today we produce examples of many models of stoves and chimneys, tiles and many other pieces of art. I have fallen in love with replicas of the traditional tile stoves. I have been mostly inspired by the characteristic hand painted ornamentation based on Dutch faience and wall tiles, so popular at the beginning of the 18th century, when our workshop was originally established. 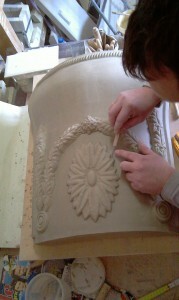 Traditional skills and the knowledge of Master craftsmen guarantee high quality and adherence to the historic originals. I choose from the plethora of historical forms and decoration, and fit them to modern or classical interiors; on each occasion I take care to respect the proportions and features that are important for the future stove or chimney owner.